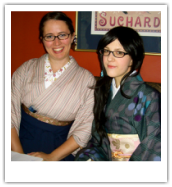 The Toronto Kimono Club (TKC) was founded in September 2010 by two women with big imaginations and a desire to wear wafuku (Japanese clothing) more often. Both women spent several years living in Japan where they developed their love for kimono and subsequently brought it home to Canada with them. Since then, the club has grown slowly and steadily, building connections with Japanese culture groups in the Greater Toronto Area. At present, there is no official member roster as there are no membership fees. If you'd like to attend events, check out the News & Events page for more info, or check it out on our Facebook group. The Founders of the Toronto Kimono Club are Kisa and Erica. While still participating in TKC events, Kisa has moved on and founded Fuuga Kimono, Toronto's first Kimono consultation, dressing, and rental business, while Erica continues to focus on the Toronto Kimono Club and it's ties with the Japanese cultural community in the Greater Toronto Area, with the assistance from some very dedicated members. Maral has been a huge support and often runs some of the meet-ups in the downtown core when Erica cannot attend. For more information about the club's history and goals, please click here. You can also check out the FAQ.